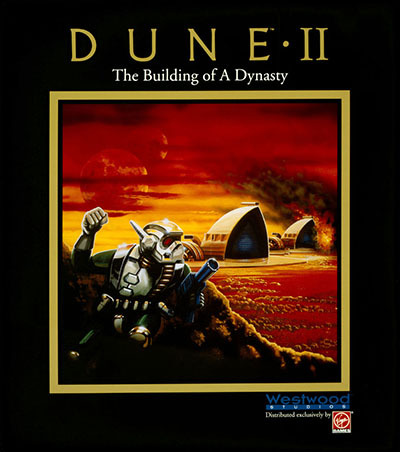 Dune 2, subtitled "The Building of a Dynasty" in North America and "Battle for Arrakis" internationally, was released in 1992. 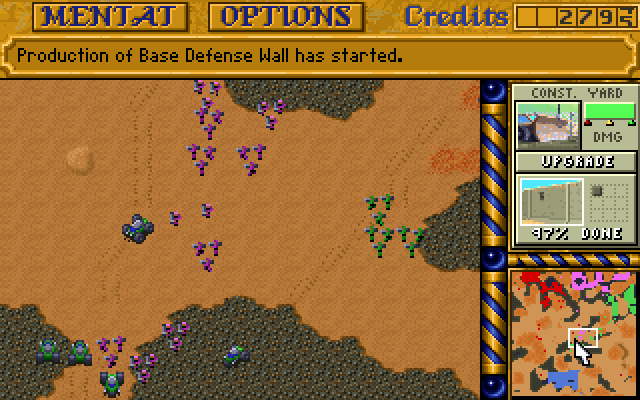 Developed by Westwood Studios Dune 2 introduced many of the features we take for granted in real time strategy (RTS) games today. 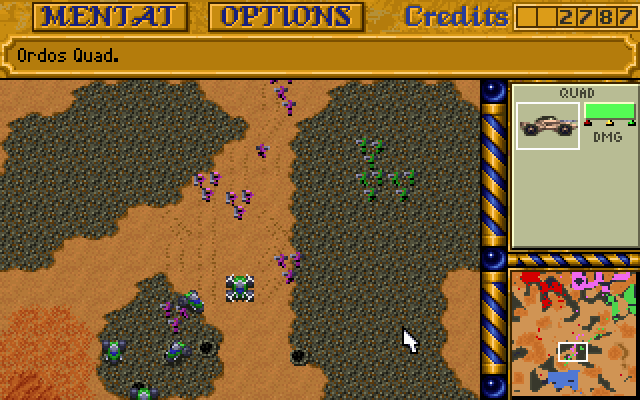 While it was not the first strategy game nor the first strategy game with real time elements, it is often considered the starting point of the RTS genre. Pretty much in the same vein that Wolfenstein 3D is considered the starting point of the first person shooter despite there being first person games made before it. 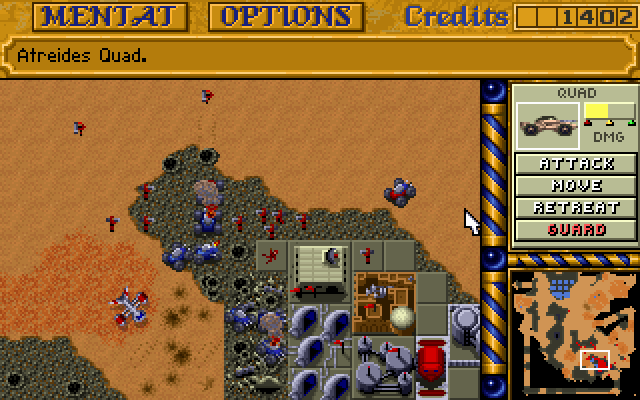 Dune 2 inspired many games after it and its influence can be clearly seen in Blizzard's WarCraft series, Westwood's Command & Conquer series and pretty much every other RTS game. 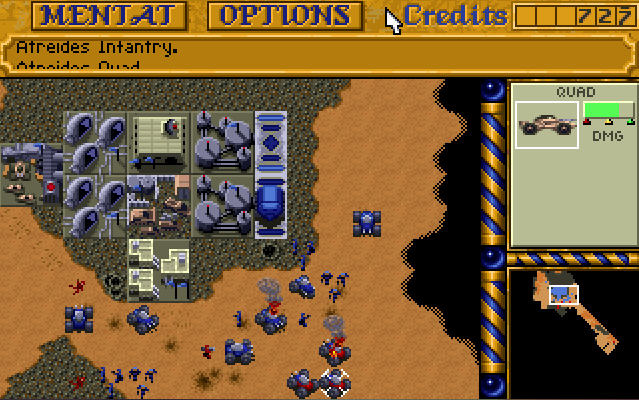 Combining the concepts of building a base, exploring the shroud (fog of war), and harvesting enough resources to build an army to destroy the enemy originated in Dune 2. Dune 2 is very loosely based upon the Dune series of novels by Frank Herbert and the Dune movie by David Lynch. It features 3 great houses fighting for control of the planet Arrakis a mostly desert planet which contains the most valuable substance in the known universe: the spice melange. The planet Arrakis, known as Dune. A land of sand, home of the spice melange. The spice is the most valuable substance in the known universe. The spice extends life, the spice expands consciousness, the spice is vital for space travel. To accelerate the harvesting of spice the Emperor of the known universe proposed a challenge to the great houses: "The house that produces the most spice controls Dune. There are no set territories and no rules of engagement". Vast armies have arrived. Now 3 great Houses fight for control of Dune. The noble Atreides, The insidious Ordos and The evil Harkonnen. Only one House will prevail! 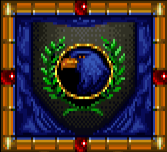 House Corrino is the currently ruling House of the known universe. Led by The Emperor Frederick IV, who was previously forced to secede his throne to his brother, to finally overthrow him and reinstate his own rule. 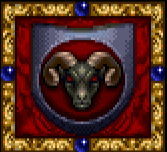 In his quest to regain the throne he has incurred a large debt to many factions, including the CHOAM the Intergalactic Merchants Guild. His largest asset is the planet Arrakis. Arrakis is the only known planet where the spice exists. It is therefore in his own interest that the production of the spice increases so that he may pay his debt. 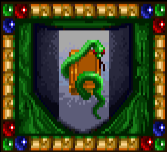 To this end he has challenged the 3 great houses to produce spice. The house that produces the most gets the sole governorship of Arrakis and a share of the tax revenue. It is unknown what the Emperor's true intensions are for pitting the great houses against each other. He does have his own considerable army of elite troops under his command: The Sardaukar. The noble House Atreides come from the lush, blue planet of Caladan. A noble people who would rather solve conflicts through the use of diplomacy rather than violence. The Atreides have access to the formidable Sonic Tank which uses sound waves to destroy enemy targets. The Atreides also have an alliance with Dune's native population the Fremen which occasionally aids them in battle. They also have air dominance with their use of ornithopters. The evil House Harkonnen are from the dark and polluted planet of Giedi Prime. A ruthless and cruel people who see any noble acts as a sign of weakness. The Harkonnen enjoy a good battle therefore they are more likely to solve conflicts through the use of violence. The insidious House Ordos of the cold ice planet of Sigma Draconis 4 are a cold, calculating house whose sole purpose is to accumulate more profits. They have no concept of loyalty and employ large numbers of mercenaries rather than to fight battles themselves. The Ordos have access to the fast Raider trike, the sneaky Saboteur and the insidious Deviator missile tank which creates confusion in enemy ranks and may even temporarily cause enemies to switch sides.